I’m in Folkestone Harbour, searching for Nice Lady of Purbeck, a Westerly Griffon. It’s blowing a Force 8 as I gingerly slide across the mud and then, through the gloom and the gale, I hear the sound of someone crooning along to a ukulele. That’s the clue I need. The 26ft Griffon, designed by Ed Dubois and launched at the 1979 Southampton Boat Show, was the replacement for the extremely popular Centaur. However, loyal customers demanded an extra 50 Centaurs before the final one was laid to rest in August 1980. By the end of the production run, in 1989, 450 Griffons had been sold. Most had bilge keels, although some deep fin keel models (4ft 9in/1.45m draught) were also built. Hull no. 149, Nice Lady of Purbeck, is a Mark I model built in 1980 and launched in 1981. The Griffon is roomier than I expect, and, with a mahogany interior, she has a comfortable, homely feel. There is a pull-out chart table to port. The galley to starboard is a bit cramped, but Pat has added stowage above the engine box and its cover provides extra work surface area. Pat makes some tea and offers to sing me another poem while we wait for the tide. I politely make my excuses, but throw him a lifeline and agree to a reading later. In the 1970s, Pat built two small motorboats and began cruising the Kent and Dutch coasts. 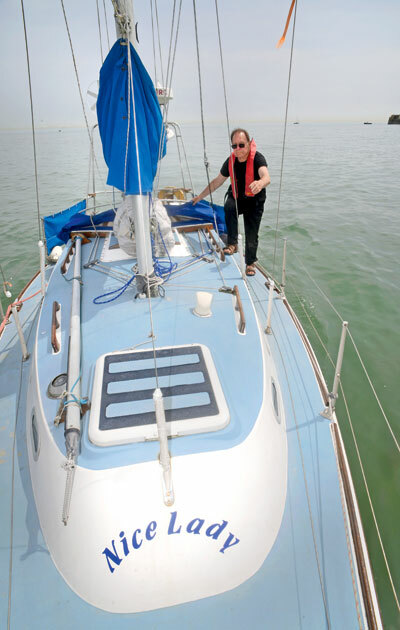 Soon bored with motoring, he bought his first sailing yacht in 1980. Lilaud was a 21ft Audacity designed by Laurent Giles. ‘I’d only ever sailed dinghies on the River Thames at Deptford,’ Pat says, ‘but I’d cruised The Netherlands in a motorboat so I stupidly thought I’d take her to Holland and learn to sail there. 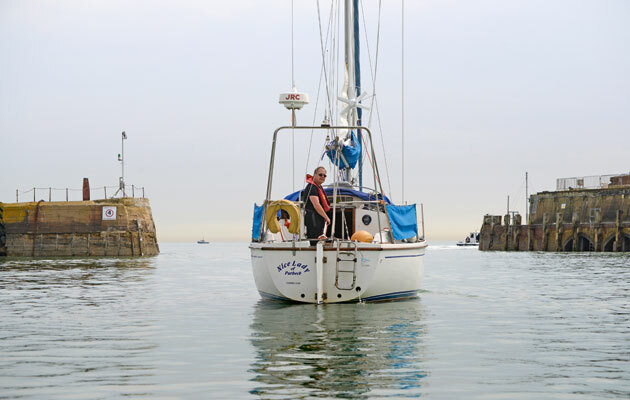 By the time I crossed the English Channel and sailed along the coasts of France, Belgium and The Netherlands, I had well and truly learned how to sail.’ Next was Zingaro, a 23ft bilge-keeled Westerly Pageant that Pat moved from Gosport to a long-term mooring in Boulogne. ‘It wasn’t as crazy as you may think,’ he says. ‘These were the days when a day-trip on the Sea Cat from Folkestone to Boulogne cost £1 and the French mooring was half the price of Folkestone.’ Pat would leave home on Friday night with no luggage, spend a weekend on the boat and buy a 10-franc return on Sunday night. Pat has kept up with maintenance, and replaced the windows and headlining. 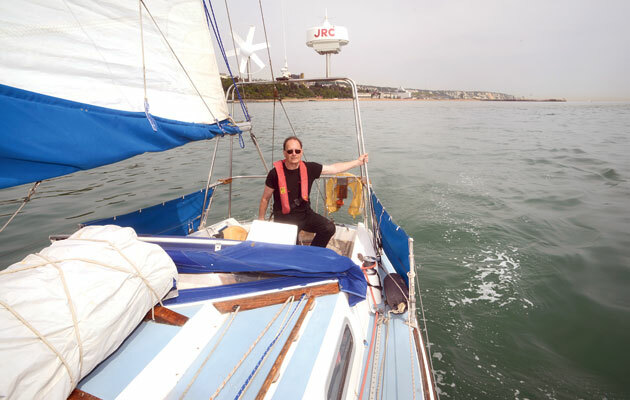 He moved the instrument panel to above the companionway, added a gantry at the stern for a radome, a VHF radio aerial and a wind generator, and fitted a removable bowsprit for his cruising chute. 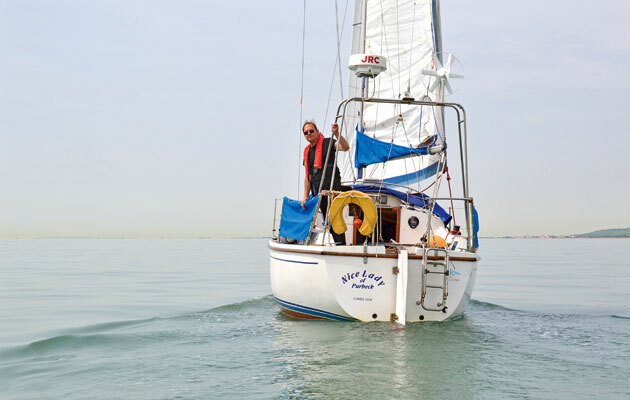 The boat had a 15 lb CQR anchor when he bought her, but Pat has replaced it with a 20 lb Danforth and carries a traditional fisherman’s anchor as a back-up or kedge. From Folkestone, Pat has cruised the continental coast north to Den Helder, and south as far as St Malo in north Brittany. One year he spent three months port-hopping to Cornwall. ‘I jog along like a pirate,’ he says, ‘hop in here and hop out there. I plunder the local supermarkets, re-fuel, fix any repairs and escape as fast as possible. I’m not one to wander around sightseeing for days on end. He pokes his head up through the companionway and shouts down to me, ‘Don’t get excited, this little ship’s not going sailing today.’ The skipper’s decision is final. We will instead have an evening of poetry recitals and song. When we wake with the morning sun, the gale has passed and it’s all go. The incoming tide slowly lifts Lady of Purbeck’s twin keels out of the mud. Moving gently, she regains her independence. The 20hp diesel engine roars into life, scattering the gulls. Pat clears the lines, manoeuvres around the small fishing fleet and heads for the harbour entrance. A perfect sunrise ignites a strip of red fire that sweeps the length of the French coast. With a little help from the engine, we run the course at a painful two knots. We pass Folkestone’s waterfront buildings, including the Leas Lift, built in 1885, and the iconic lump that is the Grand Hotel. Further along and in total contrast is a futuristic glass box containing the head office of Saga, the senior citizens’ magazine. As we turn back to the sanctuary of the harbour, Pat tells me that Spencer Tunick, a world-famous artist renowned for photographing large crowds of naked people, is to visit Folkestone. Rumours suggest he will use the harbour to create his new picture. Pat says he may write a poem about it, but has no plans to strip off and join 300 other locals au naturel in the mud. At the moment, it’s a case of the good, the bad and the ugly. 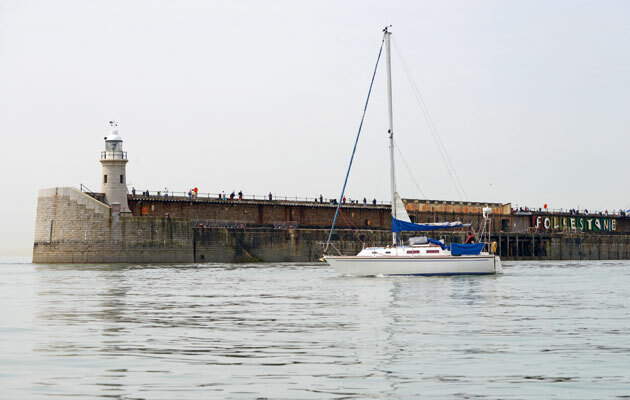 Folkestone is a quaint, old-fashioned harbour suitable only for small fishing boats, bilge-keel yachts and other small craft that are able to take the ground upright. There are pubs, quayside restaurants and fresh fish stalls and it has bucket-loads of charm, character and cobblestones. The west side of the harbour has been flattened by concrete crushers in readiness for investors with deep pockets to arrive. This place hasn’t got the Brighton syndrome yet; there are no punters sitting on balconies staring at pontoons and night-time revellers. The entrance is narrow and exposed to the east. In strong easterly or south-easterly winds, a nasty swell can make the approach treacherous. In a northerly or westerly, however, shelter is excellent thanks to the main breakwater. The harbour dries completely and boats can access their mooring for about two hours either side of high water, depending on their draught. Folkestone Yacht Club was built on a bombsite given by the local council in 1953 and the bombed cottage walls are still visible in the club’s car park. It has 135 members and space for 26 members’ boats moored in the harbour. The club is a short walk from the harbour and always welcomes visiting yachtsmen. It offers a bar, changing facilities and a function room. Boats are lifted out between October and April and there is hard-standing space in the car park. The new high-speed, 45-minute train link to London could attract the capital’s leisure sailors. A large car park adjoining the clubhouse also doubles for winter pull-out. 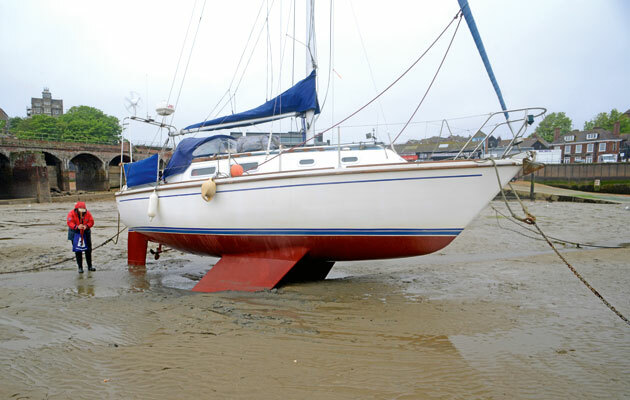 A mooring costs £350 per half year, but there is only a ‘waiting to die’ list available. For visiting skippers, daily mooring fees are £25 per 24 hours or part thereof, with a 10m upper limit. Don’t forget the dinghy and a wellies though or you’ll be stuck for hours. The Griffon (especially the bilge keel model) doesn’t like to be sailed too close to the wind, but if you ease her off to around 45° apparent, a Force 4-5 breeze will have her tramping along nicely at 6 knots or more, although making some 8-10° of leeway. Under sail, her tiller is sensitive but not too prone to weather helm – despite having an unbalanced, transom-hung rudder. She has wide sidedecks with good moulded non-slip and a full-height guardrail. Her cockpit has a spacious working area and the footwell is the right width for bracing oneself as she heels over. The wide, flat-topped coamings are high for safety and angled for comfort. There are two large drains at the aft end of the cockpit sole, along with a manual bilge pump set into the sole that can be used whilst still helming the boat. Her foredeck is uncluttered, with a simple chain-pipe to feed the anchor chain below decks and a bow roller designed to accommodate a self-stowing anchor. The masthead sloop rig is sturdy, with a single pair of straight spreaders, cap shrouds, aft lowers, a babystay and a split backstay. Rotostay furling headsail was standard, as were cockpit-led reefing lines. The mainsheet track is on the afterdeck, but a shortish boom rather compromises the sheeting angle. The Griffon is well known for giving a steady and reasonably brisk performance for a 26-footer. Previous experience of the model in stronger winds confirms she has a sea-kindly manner, even when pushed hard, and is easily capable of making long passages securely and in comfort. If you lash the tiller to one side, six people can sit comfortably on the 2m-long (6ft 8in) cockpit seats. A good-sized sprayhood will cover the first two feet of each seat, giving the crew a sheltered place to perch. A deep cockpit locker contains the water and fuel tanks, but still has room for all the usual cruising gear. The pushpit rail has a gate for boarding via a folding transom ladder, with space each side to stow man overboard kit and an outboard motor. She’s a nimble yacht in port and manoeuvres easily under power. Many Griffons retain their original 13hp Volvo or Bukh engines, but some have been re-engined, often with a 20hp Beta. Down below, she’s very comfortable for two sailors and adequate for four, with a double berth in the forepeak and a double quarter berth under the cockpit. The saloon berths can serve as single berths, too, but it would be stretching it to sleep six aboard. Saloon headroom is 1.83m (6ft), but her galley is minimalist. There’s no shower, but there is an enclosed heads compartment. 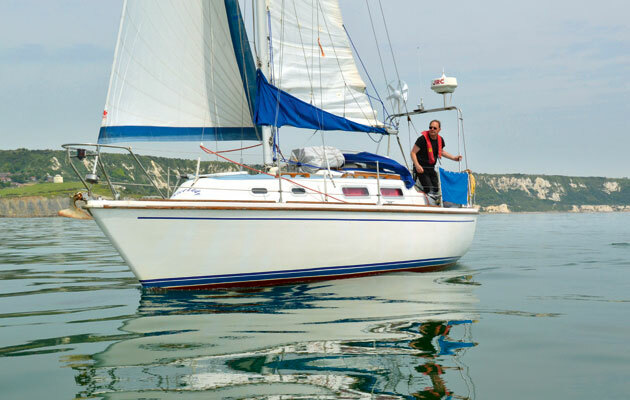 The Griffon is ideal for singlehanded sailing, but she’s also a good, economical choice for a couple or a small family. Her forte is coastal cruising and short- to medium-range offshore passages. She is easy to sail and has a practical deck layout with a secure cockpit. The hull is well-constructed, although some early bilge-keeled models did have a problem with their keel attachment and had to be reinforced by Westerly in a recall. 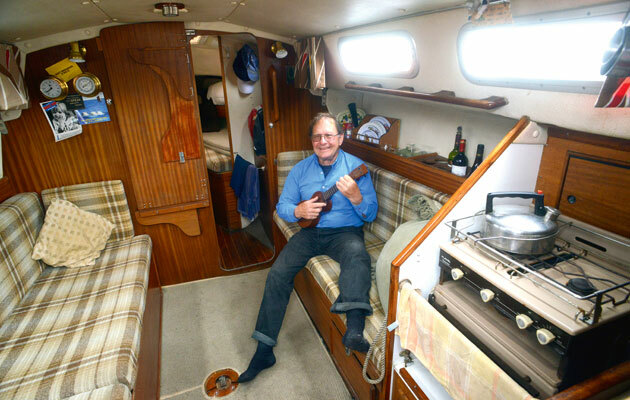 The MkI model was a little basic and lacked the smart teak joinery of the MkII, but all Griffons are comfortable and practical, above and below decks. She isn’t a speed machine; she’s best suited to pottering along – but that’s exactly what most of us want from a cruising yacht. Does she suit your style of sailing?